At first no more than a way station built by Spanish missionaries for cattle herders, the city developed, as others did from the ashes of a failed land-development boom in the 1880's. Later it was to become an agricultural center, known for both apples and lima beans that in turn gave way to residential and commercial development. Today, the city is a focal point in the county, with the Orange County Performing Arts Center, South Coast Repertory Theater and the South Coast Plaza regional shopping mall and numerous nearby office buildings. The land under what is now Costa Mesa has been known by several names over the years. The first two, Fairvew and Paularino, were communities that came and pretty much vanished before the turn of this century, according to "A Slice of Orange," by Ed Miller. Harper, springing up around what are now Newport and Harbor boulevards, developed a solid commercial and agricultural base that allowed it to continue until 1920, when, through a contest among its residents, it was renamed Costa Mesa (Spanish for coastal hill). The 1,283-acre base was located at the center of today's Costa Mesa. That land later became part of Orange Coast College, Costa Mesa High School, the Orange County Fairgrounds, Southern California College, City Hall and several housing tracts. By 1953, when Costa Mesa incorporated, it had been nicknamed "Goat Hill" for its rural flavor. In the 1960s, that began to change. The Segerstrom family, area residents since 1898, began developing shopping centers and office complexes. The family partnership built South Coast Plaza which opened in 1967 on land that was once the world's most productive lima-bean farm. Today, it is one of the world's most famous shopping malls and a tourist stop for many. The Town Center office complex followed in the 1970s, including the county's tallest building, Center Tower. And in 1986, the county's Performing Arts Center opened on Segerstrom-donated land. 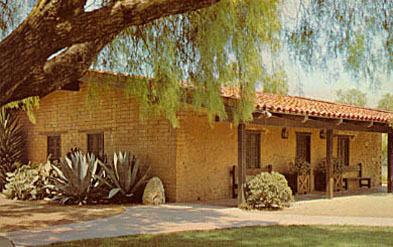 Diego Sepulveda Adobe - Estancia Park, 1900 W. Adams Blvd. The Adobe was a stopover station for priests traveling between Mission San Juan Capistrano and Mission San Gabriel between 1820 and 1823. Farm families later built a farmhouse around it. It now has been restored to the original adobe. Open to the public on the first and third Saturdays of each month, between 12 Noon and 4 pm.